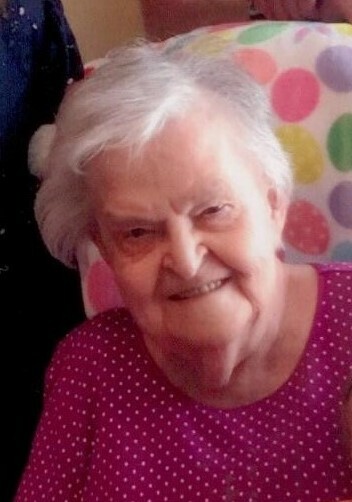 Alma “Kathleen” Yaksick, age 87, passed away at her home in Elizabeth Township, Pennsylvania on Tuesday, April 16, 2019 with family by her side. She was born Alma Kathleen Ruffing on February 16, 1932 in Clairton, Pennsylvania, one of seven children of Leonard C. and Emma P. (Bildhauser) Ruffing. She was a graduate of Clairton High School in 1950; worked for Westinghouse and Firth Loach and was a member of the St. Michael’s Catholic Church Christian Mothers. In addition to her parents, she was preceded in death by her husband of 59 years, Charles “Chick” Yaksick in 2017 and three of her brothers, Norbert, Joseph and Ronald Ruffing. Kathleen is survived by three children, Eileen (Art) Elliott, Marjorie Yaksick and James Yaksick; a grandson, Arthur “AJ” (Kristin) Elliott, IV; a great-grandson, Arthur “Jay” Elliott, V and three siblings, sisters, Leota M. Ruffing, Mary Jean Ruffing and brother, Regis Ruffing. Friends will be received in the Stephen D. Slater Funeral Home 1701 Route 51 (Large) Jefferson Hills, Pennsylvania on Saturday, April 20, 2019 from 2 – 4 and 6 – 8 PM. NO VISITATION ON EASTER SUNDAY. There will be a prayer in the funeral home on Monday, April 22, 2019 at 9 AM with a Mass of Christian Burial following at 10 AM in St. Michael’s Roman Catholic Church, 101 McLay Drive, Elizabeth, Pennsylvania 15037. For condolences visit www.stephendslater.com. There's still time to send flowers to the Visitation at the Stephen D. Slater Funeral Home from 2:00 PM to 4:00 PM on April 20, 2019.